Energy and nutrient needs vary depending on factors such as gender, age, body size and activity levels; as well as circumstances such as illness or recovery from surgery. Although our nutrient needs may vary at specific points throughout our life, a balanced diet forms the foundations of healthy eating. 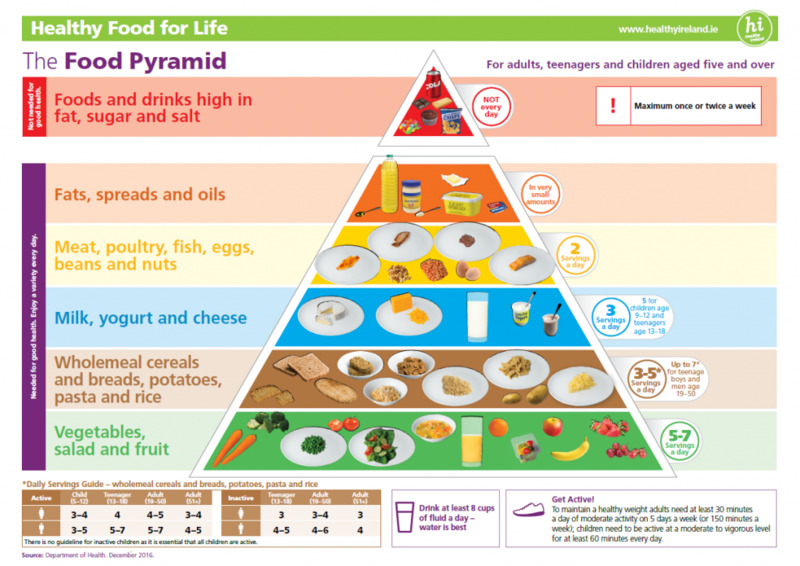 In Ireland, we use the Department of Health’s Food Pyramid as a guide to the types and amounts of foods needed for good health. The Food Pyramid divides foods into groups based on the main nutrients they provide. It also guides us on portion sizes and daily serving recommendations. Protein contributes to the maintenance of normal bones and growth of muscle. Timing and quality are important. Spread intakes across the day to ensure the constant supply needed by active muscles and joints is provided. Animal-based proteins e.g. milk, yogurt, cheese, lean meat, poultry, fish and eggs are the richest sources. Nuts, seeds, beans and lentils also provide some protein. Calcium and phosphorus are needed for normal bone development and maintenance. Calcium also plays a role in muscle function. Dairy foods such as yogurt, milk and cheese are among the best sources of dietary calcium and phosphorus. The calcium in dairy foods is easily absorbed and used by the body. Take care if choosing a milk alternative by ensuring it is fortified with calcium and vitamin D. Milk alternatives often fall short of the wide range of nutrients naturally present in cow’s milk. Other sources include dark green vegetables such as broccoli, soft bony fish such as sardines, pulses, nuts and fortified cereals. Vitamin D assists with the absorption of calcium and phosphorus and is needed for the maintenance of normal bones and muscles. It also helps to reduce the risk of falling associated with poor balance and muscle weakness. Although vitamin D is known as the ‘sunshine vitamin’, we are particularly reliant on dietary sources in Ireland e.g. oily fish such as salmon or mackerel, liver, egg yolk and dairy products/cereals that are fortified with vitamin D.
If you do not eat these foods or have limited exposure to sunshine, talk to your doctor or pharmacist about taking a vitamin D supplement. Vitamin C and zinc are essential nutrients for immune function and are therefore important following surgery or when wounds are healing. Vitamin C also contributes to normal collagen formation and normal function of the bones and cartilage. Good sources of vitamin C include fresh fruit and vegetables such as oranges, strawberries, kiwis, tomatoes, peppers and potatoes. Zinc is mainly found in meat, shellfish, poultry and cheese. It is also present in nuts and beans. A variety of supplements such as vitamins, minerals, omega-3, glucosamine or chondroitin are often associated with musculoskeletal health. However, the best way to ensure you are getting the wide variety of nutrients that your body needs is to consume a balanced diet with a wide range of foods. As some substances can interact with medications, it is important to consult your GP before taking any supplements. Dairy foods such as milk, yogurt and cheese provide many of the key nutrients that contribute to normal musculoskeletal health. Dairy is well recognised as a natural source of bioavailable calcium, which means that it is easy to absorb by the body. 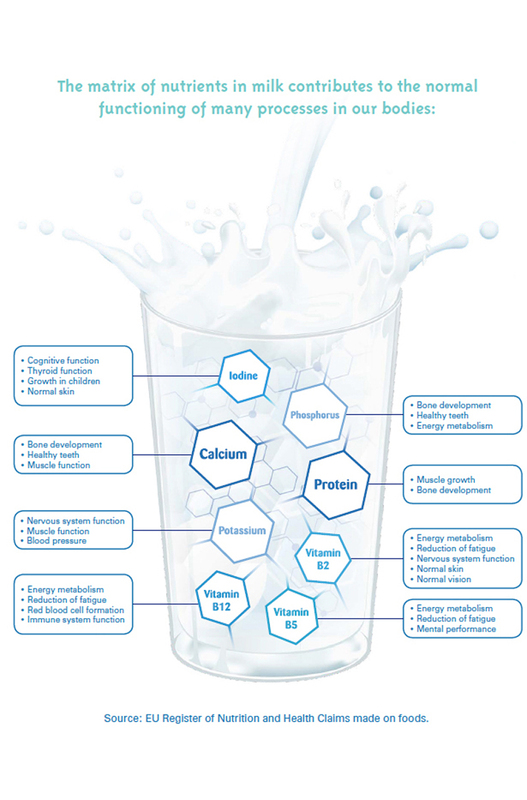 In addition, dairy foods contain a matrix of other nutrients which have important roles in health (see image). Dairy foods are versatile, nutritious and convenient foods that can be enjoyed across the day in meals and snacks, in cooking and baking. The Department of Health’s guidelines recommend three servings from the ‘milk, yogurt and cheese’ food group each day as part of a healthy, balanced diet. Between the ages of 9-18 years, five servings daily are recommended due to the importance of calcium during this life stage. Examples of one serving includes 200ml of milk, 125g of yogurt or 25g of cheddar-type cheese.